An exhausted woman collapses as she waits to cross the border from the northern Greek village of Idomeni, to southern Macedonia, Sept. 20, 2015. Under the new plan, the U.S. limit on refugee visas -- currently capped at 70,000 annually -- would jump to 85,000 in fiscal 2016 and then rise to 100,000 the following year. 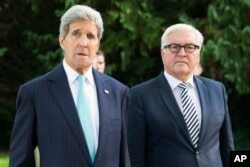 U.S. Secretary of State John Kerry, left, walks with German Foreign Minister Frank-Walter Steinmeier, prior to a meeting with a group of refugees fleeing Syria, at Villa Borsig, in Berlin, Sept. 20, 2015. Hungarian and Serbian interior ministers also jointly reopened the Horgos-Roszke 1 crossing, which had been closed since last Monday, which led thousands of migrants fleeing war and poverty in the Middle East, Asia and Africa to try to find other routes to western and northern Europe, where most want to start a new life. Most flooded into Croatia, which within days announced that it could not cope with the flow and began to redirect the migrants back toward Hungary or toward Slovenia. Romanian Foreign Minister Bogdan Aurescu on Saturday called the border closure an "autistic and unacceptable act" that violated the spirit of the European Union. On Sunday, Szijjarto said, "We would expect more modesty from a foreign minister whose prime minister is currently facing trial." That was a reference to corruption charges filed recently against Romanian Prime Minister Victor Ponta. A migrant man reacts as he is surrounded by Slovenian police at the Slovenia-Croatia border crossing in Rigonce, Slovenia, Sept. 19, 2015. Szijjarto added: "We are a state that is more than 1,000 years old that throughout its history has had to defend not only itself, but Europe as well many times. That's the way it's going to be now, whether the Romanian foreign minister likes it or not." The man was secretly filmed with a mobile telephone, allegedly telling other migrants in the center that he had fought for the Islamic State group and killed people. The video led to the probe. Migrants pull a boy through a train window at the station in Tovarnik, Croatia, Sept. 20, 2015. Investigators are now trying to determine if the Syrian was indeed a member of the Islami State group, the newspaper reported. A spokeswoman for federal police declined to confirm or deny the report. Despite the case, federal police do not believe that Islamists are infiltrating Germany through the influx of refugees. Elsewhere, thousands of migrants arrived Sunday morning in the Macedonian village of Gevgelija, on their way to Serbia. They made their way to a temporary camp near the railway station, and some were able to board a train to take them onwards in their journey with the end goal of western Europe. The bulk of the migrants are fleeing the war in Syria, with the European Union receiving almost a quarter of a million asylum requests in the three months to June. ​Germany alone expects up to 1 million asylum-seekers this year, but Interior Minister Thomas de Maiziere said the European Union should in the future take a finite number of migrants, while sending the rest back to a safe country in their home regions. The continent's biggest migratory flow since the end of World War II has dug a deep rift between western and eastern EU members over how to distribute the migrants. The crisis has raised questions over the fate of the Schengen agreement allowing borderless travel across most countries within the 28-nation bloc, with several of them imposing border controls. Migrant whose boat stalled at sea while crossing from Turkey to Greece swim to approach the shore of the island of Lesbos, Greece, Sept. 20, 2015. 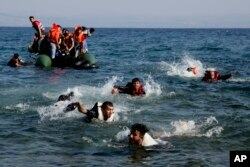 Meanwhile, 26 migrants were feared missing Sunday off the Greek island of Lesbos, one of the Greek islands that has seen a heavy influx of refugees from war-torn Syria via Turkey. More than 2,600 people have died among the nearly half a million who have braved perilous trips across the Mediterranean to reach Europe so far this year. Altogether, Greece has seen more than 300,000 refugees and migrants enter the country this year, most of them passing through to other European countries. Material for this report came from AFP, Reuters and AP.